In May 2013, we have started the restoration of the old Rustico and since the summer of 2015, the house stands in a new light and modern technology with hot water supply via solar panel and underfloor heating for our guests. The Rustico has retained its original charm while providing modern comforts. The Rustico has a large living area with kitchenette and dining area. Two bedrooms and two shower rooms are available for our guests. Mare e Monte - sea and mountains in two short words describing the wide range for the next holiday in Liguria. Whether we are talking about the range of recreation and excursions or the delicious local delicacies. The sea and the mountains provide entertainment and enjoyment. Liguria offers the rare combination of mountain hiking and beach holiday on the Mediterranean. The "Ligurian border crest road" leads to heights of more than 2 000 meters or you can get acquainted with the "Whale Watching" with up to 25 meter long sperm whales. Culinary you will be spoiled with fresh seafood or local delicacies such as wild boar or rabbit. Not to mention the pasta in many variations. The Rustico Borgata Roggio is an ideal starting point to experience this diversity and at the same time see a more than 16 000 square meters of land with private forest and 88 olive trees, the rest from the daily grind. In the main house there is a large living room with kitchen and dining area. Three bedrooms and three shower rooms provide space and comfort for up to 6 people. (Available from the season 2016) In the annex, there is another large living room with kitchen and dining area, two bedrooms and two shower rooms. A spacious outdoor area offers several seating and relaxation areas. A special place is here under our ancient oak tree which donates enough shade even on hot days. 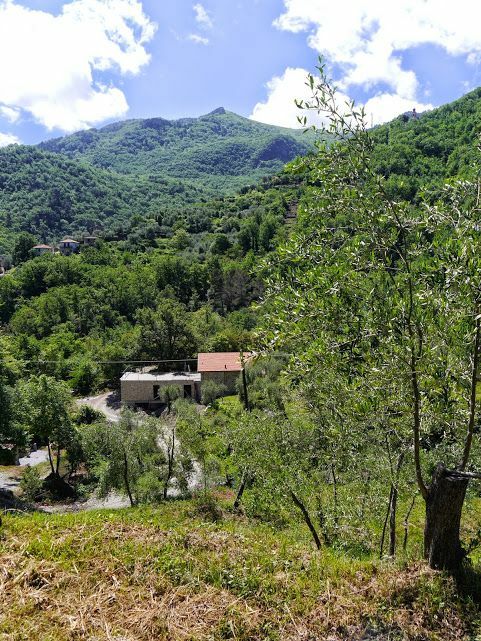 The house is located in a secluded location on a large (16 480 sqm) forest land in about 240 m altitude. The old trees - olives, oaks, pines, ... - provides shade and sun right at home. The nearest neighbors are about 200 meters as the crow flies. From the motorway exit Andora you drive without serpentine compared to 12.8 km (about 12-15 minutes) to the property. The last 200 m lead over a simple to be traveled by land to the parking lot. The site is located between Testico (about 2.4 km) with 2 restaurants, post office and a shop with a cafe, where you can buy all the food and Stellanello (about 3.9 km) is also with restaurants and shops. In about 20 minutes you are on the beautiful beaches of Alassio, Andora, etc. An optimal starting point for excursions to Monaco, San Remo, Nice, Portofino or Genoa, and in the Ligurian hinterland or the Piedmont. Combine the Italian beach life with the tranquility and secluded location of this house.